If you’re familiar with the Harry Potter series, particularly the last book or movie, you probably have some feeling about Severus Snape, played by the late Alan Rickman. While reading the book with tired eyes through the night of its release, I was floored by the reveal that Snape—the villainous Potions professor who was relentlessly cruel to Harry and the other “good” characters—had spent most of his adult life silently protecting not only Harry but undoubtedly hundreds of others by walking a fine tightrope as a double agent, ultimately loyal to Dumbledore. Furthermore, he meant for his life’s work and ultimate sacrifice to die with him. Braver and cleverer than almost anyone else in the series, his greatness was recognized only in hindsight, when the ripple effects of his courage became visible. Most people are not good or bad. They are full of complexities and contradictions. I started learning this lesson at 21 and have been learning it over and over again since. It’s a hard concept to hold on to. At 21, I was a Jesuit volunteer placed into a house of eight strangers in the Northwest United States, committed to my housemates and placement for the entire year. Upon meeting one of my housemates, I knew immediately that we would be like oil and water. Our political views and worldviews seemed practically opposite. However, I had committed to value and respect her, so all of my usual defenses and reactions had to be put aside. Instead of ignoring her, I engaged her where I found common ground. Instead of sticking to my preconceived judgements, I left myself open to getting to know her genuinely. We were never destined to be best friends, but halfway through the year when I ran into trouble with my placement, that girl was one of my staunchest supporters. I ended up loving her for her many endearing qualities: she is an incredible baker and spent her spare cash baking treats to supplement our communal grocery stash. If I hadn’t put aside my initial reaction, my volunteer experience would’ve been lesser without her friendship. In this era of memes and headline political experts, we are so quick to put people into boxes: good versus bad, ally versus foe. It would benefit all of us to imagine that, like Snape, most people we encounter have some hidden depth that we would value if it were made clear to us. Let’s look at Obama for a minute. There are many elements to the man and his administration that conservatives dislike, and it is easy to get caught up in moaning that the past eight years have hurt our country. But, to take one example, he and his family beautifully personified the strong nuclear unit that is the basis of so many conservative ideologies. There are only benefits to having a president with a smart, strong wife and two engaged, respectful children. The ripple effects of that familial example in our highest office won’t be seen for a few years, but it will only benefit conservative values if hordes of young people seek to create partnerships modeled after Barack and Michelle. What about Donald Trump? Fresh into the first month of his presidency, there are a thousand things about the man that make me cringe. But the sheer outrage aimed at him daily has surfaced at least one title he doesn’t necessarily deserve: anti-gay. He was the first Republican presidential candidate to hold a rainbow flag on the campaign trail. In his initial “60 Minutes” interview after winning the election, he referred to Obergefell v. Hodges ruling as “settled law.” Soon after entering the presidency, he released this statement detailing, once again, his respect and support for LGBTQ people. His presidency could be great for the gay community, laying down a foundation of support that sets that bar for all future presidential candidates. It would be incredible if it was no longer an option for a candidate to run on a “marriage is between a man and woman” platform. Before you write me off for whitewashing Trump, looking for Snape in someone does not mean ignoring the injustices they commit, and it also doesn’t mean that good deeds cancel out bad ones. It means that despite countless examples to the contrary, there is almost always something about someone else that you can find value in. 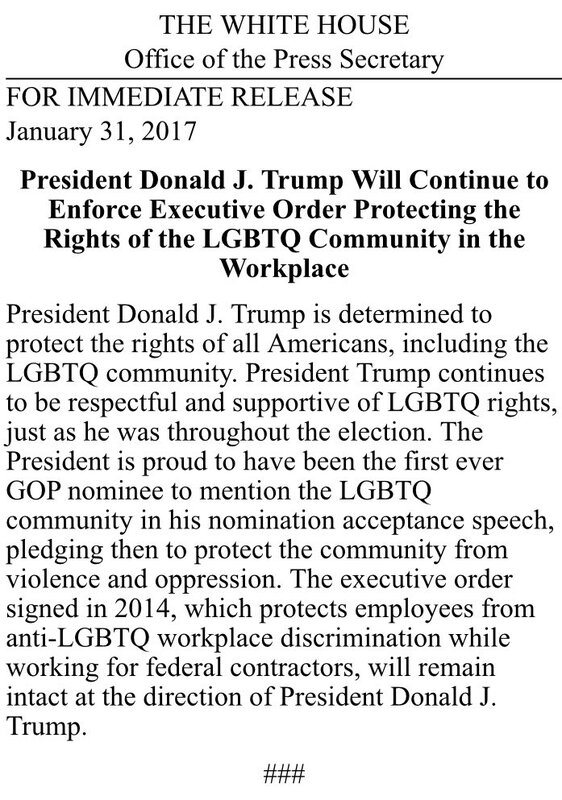 So, yes, Trump may be turn out to be really terrible for a lot of ideals we hold dear, but what if he does something great for the future of LGBTQ Americans? Do we have the ability to hold that in a vacuum and say “Thank you” for that one piece, and move on? Even beyond politicians, do we have the self-awareness to put our guard down and be open to the people around us who do not experience the world the same way we do? Here’s my suggestion for a better week: take some time away from Facebook (it’s dead anyway) and the endless news cycle, and look for Snape. G. S. McCarrick is a New York native.